Summary: When her brother dies in a fire, Sasha Harless has no one left, and nowhere to turn. After her father died in the mines and her mother ran off, he was her last caretaker. They’d always dreamed of leaving Caboose, West Virginia together someday, but instead she’s in foster care, feeling more stuck and broken than ever. Review: If you are a fan of Sharon Creech then you will love Free Verse. After a few chapters, I paused and checked the cover to make sure I hadn't made a mistake and picked up a Creech novel. The writing style is so similar and artfully written. I think it's important to know a little about the story to peak your interest but not too much. The story starts off with Sasha a young girl who is suffering yet another loss, her firefighter brother. Set in a coal mining town of Caboose, West Virginia and left with no family Sasha is sent to live with a foster parent whereupon she meets the neighbors next door. Unbeknownst to Sasha she discovers a family connection. I enjoyed the first person narration and the places written in prose. 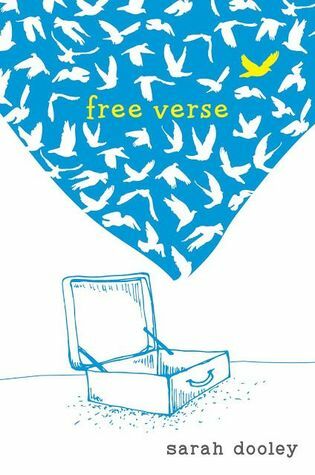 Freeverse is a tender story about the struggles of loss, acceptance, friendship and family. There is also a little suspense that takes place and I had to fight the erg to skip ahead to find out what had happened. I highly recommend this book to all Sharon Creech fans. I would also recommend this book as a read-aloud for a younger audience. It would be a great way to introduce several themes in literature and definitely a beautiful example of poetry in prose.